A human-kindness driven phenomenon found on the Appalachian Trail, known as "trail magic," provides food and assistance for hikers attempting the long traverse from Georgia to Maine. 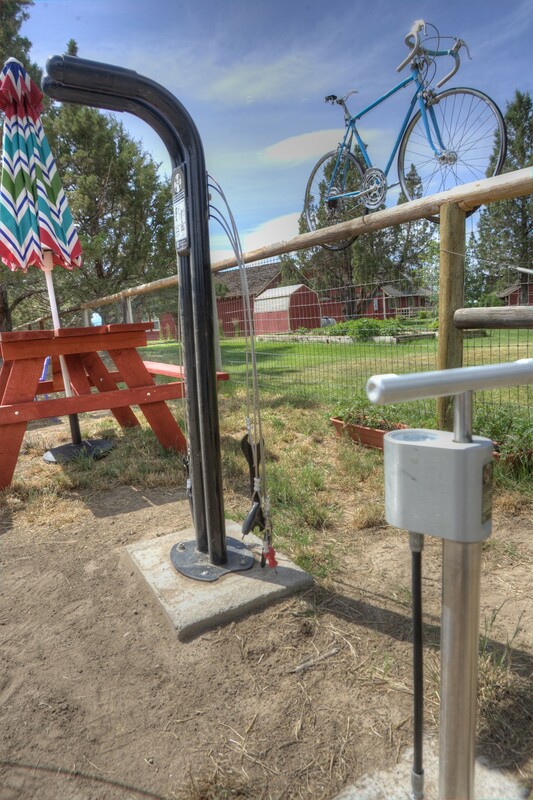 And now, Bend can now boast about its own version of trail magic along the 36-mile Twin Bridges Scenic Bikeway with the installation of the first bike aid station at the corner of Cori Way and White Rock Loop on the Tumalo section of the ride. "Folks have long been stopping at this corner and, as a rider myself, I began to think about what would make their experience better," explained Bob Haas, the creator of the idea. "I decided to provide air and tools in case a rider experiences mechanical issues." Haas admits he could have simply bought all the necessary tools to make the stop useful but made a conscious decision to allow the idea to grow organically with as much community support as possible. He didn't have to wait long, as neighbor Nunzi Gould readily provided the air pump and tool set. "Nunzi is an active community supporter and had the tools and was looking for a location for them," said Haas. "I crossed paths with her and told her I was getting ready to do this and she loved the location." Amanda Tyvoll at the Tumalo Coffehouse quickly came on board as well, donating a picnic table and umbrella to Haas. Tyvoll, whose location is another well-visited stop along the route, has plans to add a similar aid station adjacent to her business by August. But, it was the support of Deschutes County that allowed Haas' idea to become a reality, allowing for the placement of the aid station on County property. "Liability was always a concern and George Kolb with the road department worked with us to take on that responsibility," explained Haas. "There is a formal license agreement and stations must conform with city conditions." Haas admits to not being done with the aid station. 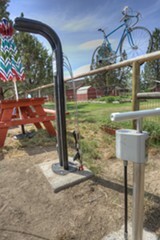 Borrowing from the model of the "free library' kiosks that dot the landscape, Haas, who received the individual Chainring Award from the Deschutes County Bicycle and Pedestrian Advisory Committee for his idea, is planning on providing spare tubes and bike parts for riders, donated by other riders. "It will operate under the honor system," explained Haas. "If riders need a bike part they are free to take it—next time they come by they might drop something off." Haas refers to the aid station as a "Mark Twain paint-the-picket-fence" type of project. "I have had some real contributions from folks here and everyday I meet someone new," he said. "What I really hope for is that people take the time as part of their ride to have lunch and enjoy the spot and experience."